There is such a thing as perfect happiness, and I feel it as I blog tonight. The cozy rain has been pouring all day long, the lights of the Christmas trees in our house fill the kitchen, the living room, the playroom, and the master bedroom. I spent all day surrounded by family I love, filling the house with laughter and play. My daughter and husband are sleeping contentedly. And I love our annual McGaugh Christmas party, a time to celebrate with Bill's side of our family. I really love it and look forward to it. This year I changed the menu to a more traditional Christmas feast: roasted turkey, ham, orange rolls, creamed corn, mashed potatoes, cornbread and apple stuffing, orange zested cranberry sauce, gingered pear tart, and chocolate torte, plus starters. The food felt so festive! I've always done an Italian dinner, which I love, but it was fun to do something different this time. This is a view of our dining room/living room from the top of the stairs. We set three tables in reds, blues, and creams with accents of green. A view of the kids' table. Am I really old enough to be setting a kids' table now? Our picture before the party begins. Every year, we take a picture together before the party in front of our tree. 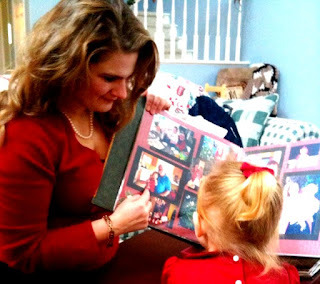 I am showing her our Christmas scrapbook, which Kathy Altaras made me for a wedding gift. She has several years worth of pages planned out and I paste in the pictures each year on the designated pages. It is one of my most treasured wedding gifts. I love it, love it, love it, and so does Katie. I am pointing to a picture of Katie and Daddy from last year's McGaugh party. Katie worked in her kitchen while I worked in our bigger kitchen this morning as we finished our cooking. Our second cousins on Aunt Sharon's side, and cousins-in-friendship: Bernicie, Marcella, and little Sharon. Our annual McGaugh Christmas picture. I love these guys! We had a fun day, and I welcome the chance for Katie to make memories with her aunts and uncles and cousins. Those family relationships are so important. What a gift was today!